Adding an aggregated total to the top of a stacked column chart sounds simple enough. It’s a couple of clicks in Excel. In MS CRM 2011 however, it is a different story. You would have to add an additional series to the chart, which then calculates and displays the total. But Stacked Column charts in MS CRM 2011 do not support multiple series. But that does not mean it is not possible. This CRM chart show us the aggregated total value of each of our pipelines, stacked by the pipeline phases, for each of the types of purchase processes. So how did I create this chart? First, I need a chart with a series for each of the 4 pipeline stages, and one for the total. Then I display the series in the chart so they look like a standard stacked column chart. The total on top is a point chart type. The drawback here, is of course that all the possible series needs to be known so we can include them in the chart. In this case, all the series are each phase in the pipeline. Since the user interface in MS CRM 2011 for creating charts does not support multiple series for stacked column charts, we need to create something else as our chart XML base and work off that. I will use the UI to create a normal column chart and add all the series I need. In this case a column chart with 5 series. 1 for each of the 4 stages in the pipeline (Develop, Qualify, Propose, Close) plus 1 extra series for the total. I want to see how my pipelines looks between the different types of Purchases Processes, so I’ll pick “Purchase Process” as the category so I get that on the X axis. All the series I have added as a standard column chart. 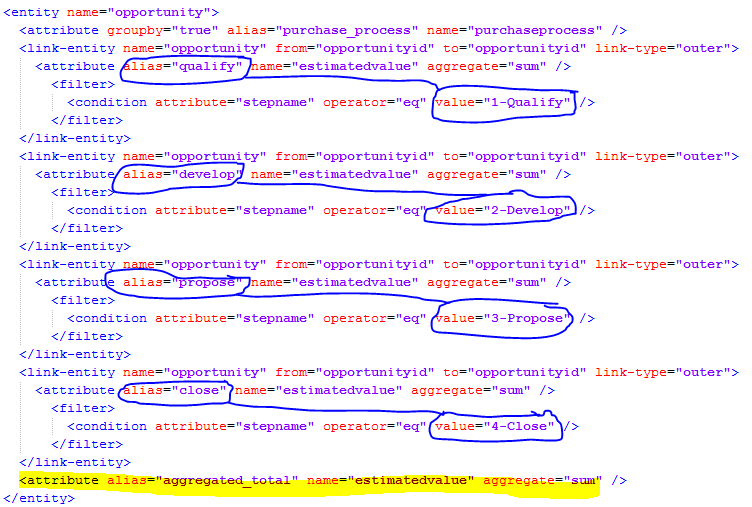 CRM 2011 might add some references to a secondary Y axis in your XML. If that is the case, remove these first. I’ll start out by renaming all the aliases to something more sensible and easier to work with. Now it’s much easier for me to see which alias represents what data. 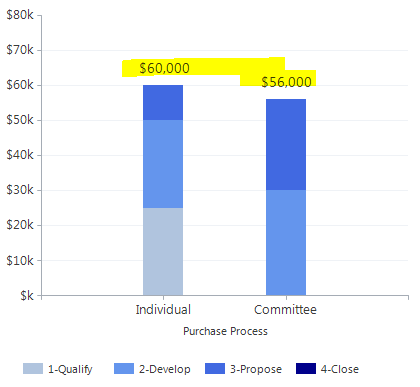 I have “Purchase Process” as the category, the name for each pipeline phase, and the aggregated total at the end. Next I’ll change the first 4 series for the pipeline phases from ChartType=”Column” to ChartType=”StackedColumn”. Let’s do a quick import of the chart xml just to check what it now looks like in CRM. We can see the total amount in the larger font, but the different pipeline phases are also showing the aggregate amount. Let’s add a filter to each of the series in the fetchcollection, so they only show the correct amount for each phase. I’ll add a filter to each of the series by creating a self-referential <link-entity>. This will allow me to make sure each series only sum up the value of the Opportunities, specific to its phase. The easiest way to get the filter properties is by creating them in Advanced Find and export the FetchXML. Each attribute will get a <link-entity> and <filter> added as follows. Here’s a part of the fetchcollection with filters added for each attribute for the pipeline phases. The last attribute I’ll leave without a filter as we do want the total on that one. Time to import the XML and have a look. Chart is now filtered and stacked properly for each series and there’s an aggregated total on top. It works, but we can make the chart look a lot easier to read and understand. IsValueShownAsLabel=”false” on all series except the total. Last, I’ll reverse the series in the legend, because MS CRM 2011 automatically reverses it on stackedcolumn charts. In other words, I reverse the reversed order so it reads 1-2-3-4 instead of 4-3-2-1. One final import of the CRM chart XML and here’s the result. How about an Aggregate Total on top of a Stacked Bar Chart? These chart xml samples are for reference only and not intended for use in a live environment without thorough testing. They were created on a Microsoft Dynamics CRM 2011 trial with only the sample data added. The only addition I made to the sample data, was adding values to the Purchase Process field on the Opportunities. Excellent post – I especially like how you show the interim stages so people can see how it builds up, and what each XML change does, rather than all in one “ta-daa! !” moment at the end. Also helps troubleshoot if someone makes a change which is not right, they may be able to spot which step has gone wrong. Hi Konrad – Thanks for reading. In a multi-series chart like the one in this post, you can determine the order by adding the series in the order that you want. If you are doing a regular stacked chart, it’s a litte more tricky with the coloring, but you should be able to order the chart by adding an order clause or two to the fetchcollection. However, the coloring can vary since they are based on which type of records are available first in the dataset. You may need to add some dummy records to ensure correct colors in that case. Thanks for helping! Oh, I think I’ll hit the wall on this one. My client wants to show a bar with the number of tickets in a queue. Easy! But, he wants them to be colored differently depending on how many days they’ve been in the queue. So I entered the aggregation “by day”. The problem is that the suckers with shortest period get on top, not at the bottom. Could I color a whole bar (no aggregation) with a gradient, so that the bottom is always green and the higher the bar, the more red it gets? Gradients are fairly straight forward, but a gradient based on the height of a column may not be possible. If, and that’s a big IF, it’s possible it would probably have to be some kind of combination chart where a transparent bar reveals more or less of underlying bar which has the desired color grading. But let me stress that I’m not sure if it’s achievable. Great Post. Is it possible to aggregate a Stacked Chart with 2 Categories? 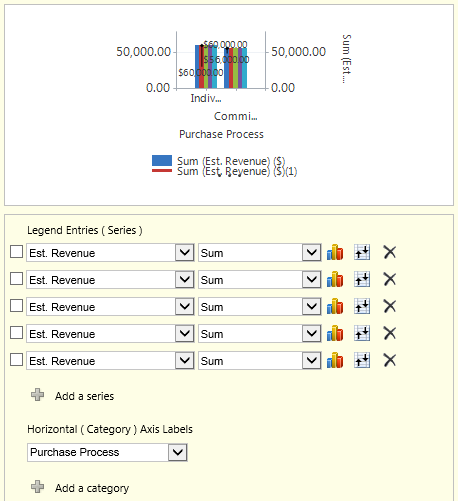 The 2 Categories allow one and only one series in the chart wizard. Unfortunately you can’t do that. Even if you added the second category on stacked chart, CRM wouldn’t allow you to import it. This was really helpful and I was able to create a stacked bar chart. One thing to note, you need to place the aggregate_total attribute first to get the mouse hover to work properly. I wanted to use stacked charts (actual, weighted and unweighted), but I realized that stacked columns give me 100k+180k+300k chart, so total 580k. What I really want is to have chart where actual is 100k, weighted is 180k shown as 180k above actual and unweighted (300k) shown as 120k above weighted). At the end total should be equal to actual+unweighted pipeline (100k+180k+120k = 400k) so the difference between weighted and unweighted pipeline only, not sum of all three (580k). If I would use regular columns then I would get side by side 100k, 180k and 300k, so that would again represent the numbers wrongly as there would not be actual+pipe chart. – do two stacked bars – actual plus weighted and actual plus unweighted side by side (100k+180k) side by side with (100k+300k). 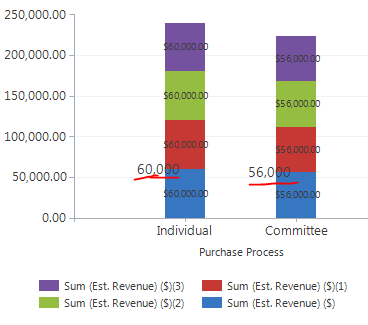 Is this doable in chart only (and how) or do I need to do calculations in the Goal entity? I can provide graphic idea if you need it. But I couldn’t get any of them to work. There is always problem with XML syntax. Your ideas and expertise is much welcomed. Shows the actual and estimated revenue against the budget and forecast. Sounds like this is exactly what your are looking for. hmm, is there an easy way to sort based on the aggregate total then? I have a client that wants to break down opportunities based on a master category (which is in the opportunity). So Y is estimated rev, X is opportunity owner, with a secondary category being master category. There is an aggregate total then by which I would want to sort in descending order. Can’t figure out where to add the sort clause. thoughts? it’s not far off from what you are doing here. Hi Brian. Sorting seems to be limited to only the values/names on the X axis (the groupby attribute) when using multiple series. Sorting by an aggregate appears to work only on charts where you have just one series. I would imagine the same goes for categories although it is not an area I have tested fully. This was a bit of a bugbear that I finally managed to figure out. Hope this helps for your scenario too. Hi, Great article. Just implemented it and it works great. One slight glitch though. When a bar shows a couple of colors and I click on one to drill into the records, all of the records represented by the colors in the total bar are displayed. thoughts? Yes, that is a limitation when using multiple series in a stacked chart. However, you regain that functionality as soon as you do a drilldown on one of the chart areas. Not as good, but close. I guess we can’t have it all. Good stuff! One question, is there a XML attribute to align the data point labels to the top? My tallest column always places the label below the data point resulting in inconsistent placement of the column value. Have been looking at the MSDN documentation for chart label attributes but cannot seem to find alignment modification. 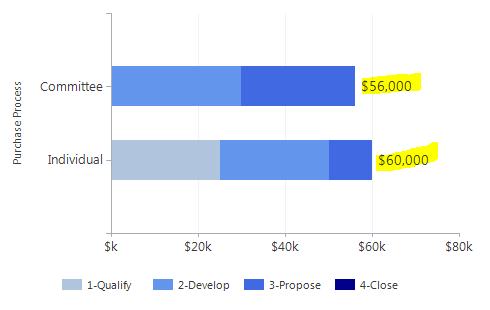 That type of custom property is also used in this post https://crmchartguy.wordpress.com/2013/09/16/design-options-for-bar-charts-and-top-x-bar-charts/ although there it is called BarLabelStyle. Excellent post. I used this method to implement a RAG (red, amber, green) chart where I could align the relevant colors with their associated values, and it did not matter if one of the values was not present. on the MS Dynamics CRM 2013. It looks like after doing the steps from “Change the Series Chart Types” and after importing the corrected xml file the chart doesn’t have one cumulated bar but separted 2 bars for each of two values. Any idea ? Hi Marc – Thanks for reading. Sounds like your chart type is “bar” instead of “stackedbar”. Or column instead of stackedcolumn if you are doing a column chart. Thanks for the replay. I have of course stackedcolumn chart. But as I wrote earlier it doesn’t show one stacked column but two :-(. 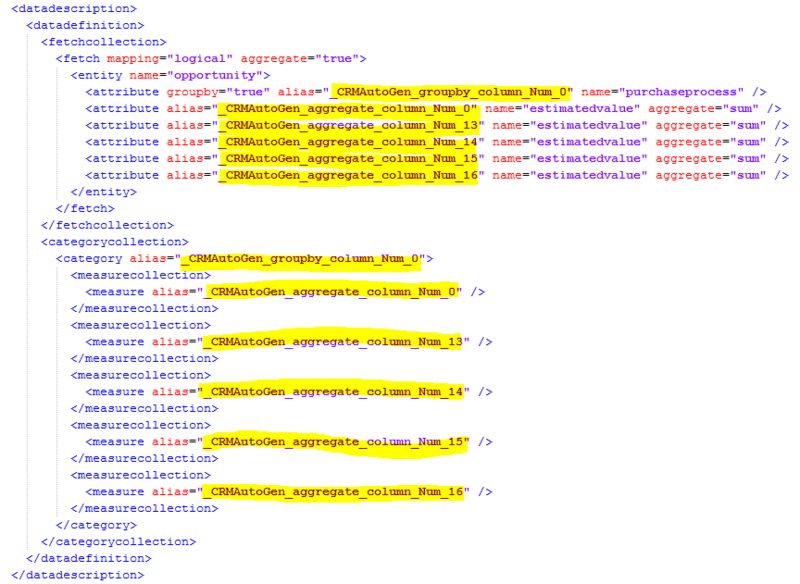 Below I added the part of modified xml file. Maybe you can tell me what is wrong. WordPress doesn’t allow xml in comments unfortunately. However, if both your series are chart type stacked, and you still have two bars instead of one, there’s probably a stackedgroupname in the custom properties section of the series. Either make sure both series have the exact same name or just remove it entirely. Thanks for help. There was a property in the series section which had the reference properties connected with axisy. After removing it it worked. I have 2 values in CRM: tpv_value and weighted value, where weighted value is a part of tpv_value. Sales Maker1 sales maker2 …. It is possible to do it in CRM 2013 ? I have a requirement to display the users having how many phone call activity as a chart. for ex. Hi Rob. The “from” field is a party list and not a field per se. Unfortunately party lists are not fully supported by charts, so you risk running into issues like the one you mention. Really great job that you’re doing Mr Chart Guy and actually it helps me a lot to create by dashboards. Could it be that since I’ve added 1 column (actually the one for which I want this stackedbar) via the advanced find and related to option, that I cannot apply your methodology to get my stackedbar chart ? Could it be also the fact that I do not have the results as “sum” but as “count” ? Your series of posts has been invaluable in allowing the creation of useful charts. Thank you. But there is one thing I am currently unable to achieve. – Label (LabelToolTip=”Total #LEGENDTEXT #VALY”). Hmm, this doesn’t appear to work with Count fields — does that make sense to you? I would have figured the Filter would not discriminate, but I just tested this with what I intended (which didn’t work) and then tested it against an arbitrary Whole Number field, and it worked. If you’re counting, you need to use “countcolumn” instead of “count” as your aggregate. Wow, that’s wonderful. Thank you! The problem using “countcolumn” is that it counts only nonempty field values. So if someone want to show how many empty values and color them as well than it will not work. Is there a way to show the total of all the slices of a pie chart? Maybe off to the side somewhere? For example, I’ve created a pie chart showing orders by sales coordinator at a certain store location. Is it possible to show a total of all the orders at this location on this chart? Ok I have another question, totally unrelated to my first. 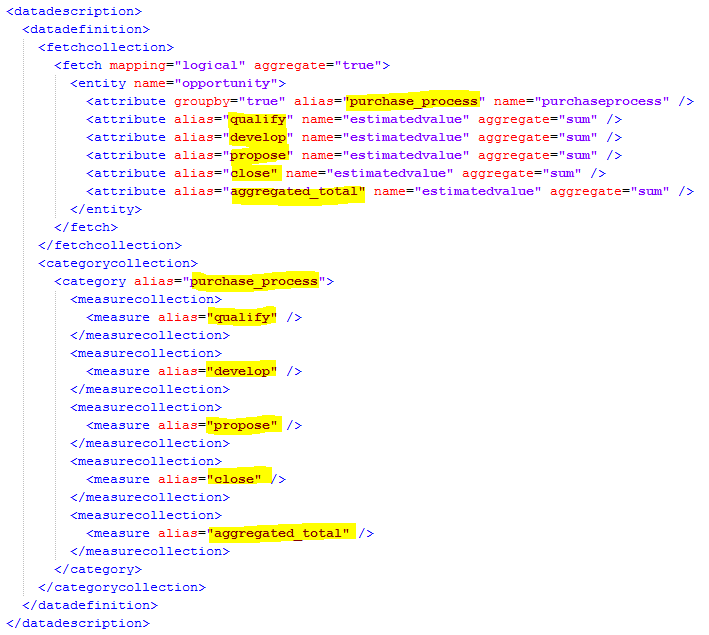 The specified XML file “Activities by Owner and Activity Type (Stacked Column).xml” is either not valid XML or does not conform to the chart schema. Ok well that’s not my XML. Just realized WordPress doesn’t allow XML here. Can you give me any advice based on my explanation? Is it possible to have 2 stacked columns + 1 column in a chart? But when I do this the the 1 column is not drawn side by side with the stacked column instead it is drawn together thus overlapping the the stacked columns please help. “The specified XML file “abc.xml” is either not valid XML or does not conform to the chart schema” . I think the issue is with below xml. Any idea. Hi Kesey. The comments doesn’t support code. I’d suggest when creating the chart, you upload frequently, so you can identify at what step you start running into issues. I am trying to implement this approach for count scenario.I have field in account entity that contains four possible values blank(no value),Red,Green and yellow. On the x axis i have those values and y axis show the count for the fields. When i implemented the approach it does not count for null or blank values and for all the legend series it shows “Count:nonempty”. This is a really useful post. Thanks for taking the time to document it. I hope someone can assist me, I have a chart with one series and two categories but I can’t seem to get the Top 8, I have added count=”8″ in the mapping and I have added a order clause but as soon as I do that my secondary category’s data disappears, please can you point me in the right direction please. is it possible Point chart type is no longer available in the 2015 version? Having done your example, I get 1 stacked column with 4 values and 1 next to it for the total. Another question: is it possible to have more than 5 series for the stack ? it seems to be restricted to 5, so 4 “stages” and a total. First of all, thank you for this great post! I’m assuming I need to use the underlying numerical value instead of the text label, but I have tried it both ways without success. I have also tried the “like” operator instead of “eq”, also to no avail. Thanks for reading. Sounds like your aggregate is “count” instead of “countcolumn”. I could like to have grand total of chart , in your case is 60,000 + 56,000 = 116,000. Do you have any idea to make it appear somewhere in the chart? Great post, got some fine looking charts out of it! However, it seems like I lost some drill-down functionality. My chart is based on opportunity statuses(won/lost) (y) and owners(x). When I click on for example, lost for one specific owner, it filters on the owner correctly, but shows me all opportunities for the owner, not the specific status I clicked on in the graph. So correct filtering on the owner but not the status… Any suggestions? Im trying to do the same thing, did you work this out at all? Great post, have managed to do a lot of things with the charts in CRM 2015, however, i am hoping someone can help by either telling me its possible or not. I have a funnel chart which is showing Est Value, is it possible to add percentage to this chart as well?? Hey. Late response here, but hovering over the legend items will show you the percentage. Hi there, Thank you for your posts, I have your site open all day everyday as my go to reference, it’s great! I have a question, I have three columns within the same entity. 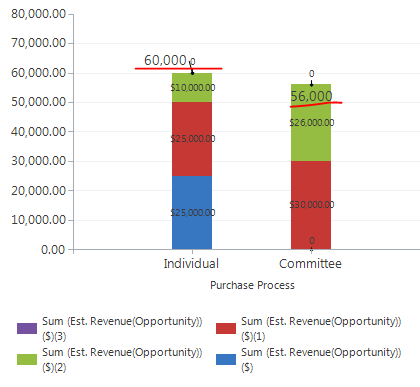 I have column a,b and c. I would like to display columns a&b as a stackedbar in the chart, showing their individual sum and aggregated total on top and then, i’d like to display column c as a bar showing its sum next to them. Is this possible? Thank you in advance for any assistance. Does this work in Dynamics 365? I’m seeing all my Stages with stacking. Just wondering if it still works or if I need to make other changes. Thank you. I love all your help. Yes, the process still works in Dynamics 365. But if you are using stages from the Business Process Flow you will have to change the fields the filters are reading. I’m sorry to ask but I’m not sure what I need to change them to. I do see an extra Link Filter in my XML at the very beginning, but not sure where I need to change filter. Is there a reason you wouldn’t be able to see these totals VIA the APP on an apple device? No problems with the Android. Does this work in 8.1/8.2 with a “count” of an OptionSetValue? I believe I have it all right, but when using the “outer” link type, I get a sum equal to all records instead of the individual breakdowns; when I use “inner” which makes more sense to me, I get no data at all. Hi Clint. Yes, that works in 8.1/8.2 and 9.0 too. You need to use “countcolumn” instead of “count” when counting though. I’ve tried to do this, but can’t quite figure it out. I’m trying to filter the stacked sections based on an order status, but the revenue is on an order line. So, the lines contain my revenue and I want to show each section of the stack based on a Contracted deal and a Pending deal. Is this doable? Every variation I’ve tried I either get an error or each section of the stack is what I would expect to be the aggregated total of the stack. One error I get is that there are too many lines/records, the others that I see are when I import the chart itself. Thanks for the amazing blog post, I never knew you could do so much within CRM! I was following the guide, and wanted to know if you’re able to sum something on one entity (say, opportunity), whilst filtering on a field in a different entity? When linking one entity to the same entity (as you have done above), it’s possible, however I can’t make it work when linking to a different entity, as the line is referring to the linked/filtering entity, not the original one. Do you have any advice to an XML novice as how this i possible? Thanks for sharing amazing post. Very informative. I just want to know how can we add aggregated total to already stacked graph or to pie chart. I have a chart with Total Amount as series and Payment Status and Date Paid as Horizontal Axis. I have months in stacks. How can I add another stack to display total revenue. thanks for all of these great posts, still learning by viewing them again and again. On the stacked column chart, I wanted to create a chart by Est. Close Date (x-axis) and stack the partial rev by an opy-field called confidence rating, which has three ratings. These ratings shall be visible in different colours and aggregated and stacked up to the total on top of the column. The resulting chart should show the rev by confidence rating by upcoming quarters. I am struggeling with the filter and to aggregate the rev by the confidence rating in there. Do you have any idea? Hi Erhard – from your description, it sounds very similar to the example, except you will need to adjust the filter in each of the linked entities to match your custom confidence rating field. Is this something you could build with a column and stacked column chart combined in the chart editor. That may help get you a part of the way and then only do touch ups in the system. Do you have a sample of top 10 customers against case, where count is for each customer case type? We want to show top 10 customer w/ cases and then stack case type? Not that specifically, but your process would be very similar to this post, except you are referencing other entities. Thank you for your perfect blog. I think of a variation of your situation. The goal is to display an average of how long it takes to process an opportunity from its creation to the closure using the process times of individual stages. Let us say there is a field for each stage on an opportunity tracking how long an opportunity was in each stage (filled in only if the opportunity was in the stage). I suppose I could create a stacked column chart with averages for each stage. It is fine. However, if some opportunities do not go through all stages (e.g. some start with the Develop stage), the chart is not relevant as the sum of the stages’ averages does not equal the average of the total opportunity process time. So the question is – is it possible to somehow resolve the situation using charts without amending the data model? E.g. can the fetch be designed the way that the data is first grouped by opportunities as sums and the attribute for the avg meassure would be these sums per opportunities? Probably not, right?